It was one of the heaviest rains I’ve ever shot in. Even with my umbrella, I was completely soaked… I was even worried that I might have spoiled my iPhone since it must be drenched in my pocket. But seeing the picturesque atmosphere brought out by the street lights under the rain, I knew I had the potential keeper just waiting to happen. So I moved on. While I was standing in the intersection, crossing paths with pedestrians hurrying to get to shelter, I noticed this lone figure from afar… right in the middle of Orchard Road. The silhouette was walking away from where I was, so with my tiny umbrella on one hand and camera on the other, I ran towards it to catch a better look. Suddenly I realized the figure was actually walking towards my direction! I hurriedly backed up until I got the framing I wanted. I knelt down, pointed, and just clicked away. When the figure walked past me, I realized it was an old lady. 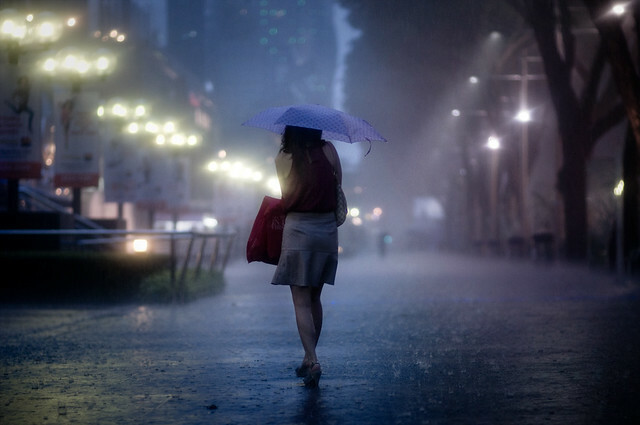 She was just casually walking, braving the heaviest of rains, with the street all by herself. What a big contradiction to the younger crowd I usually encounter, hurrying to get to shelter like the rain was a bad thing. This is lovely, Danny. As always. The lights make it look surreal. Wonderful shot. I think too many people underestimate the effort and dedication necessary to get such great shots as yours. Man, this is just great! All your pics are awesome Danny, I’m a fan :) Cheers! awesome night scene! reminds me of Blade Runner ;) I lay awake last night as a line of thunderstorms passed over for hours on end… and to be honest the thought of going out in the wind and rain to shoot pictures (I live in the suburbs… not very photogenic) never occurred to me. Beautiful! I love your dedication to brave the rain in pursuit of the image! Love the shot Danny. You are an inspiration to all street photographers. hell, all photographer for that matter… If you dont mind me asking, what ISO did you us here? and i can imagine, shot at f1.4.. correct?? another piece of art! beautifully captured! Awesome shot Danny. Love the story. very well done sir. i love the way the rain looks like a fine mist. and i applaud your dedication in taking these bad weather photos; risking your gear and all. Beautiful photos man. I really enjoyed how you got the photos too! Wow, I am so impressed with your work. Thanks for sharing some really sensitive and unique images. once again amazing, superbe colors, composition… great work! Awesome stuff Danny, you have a wonderful sight especially for street photography enthusiasts like me. I don’t know why you call this bad weather…this is GOOD weather. Excellent skills on display. I get excited when the fog picks up here in San Francisco, it means that it’s time to get out there and isolate some people. Great shots, I’ll be following you in my reader! Your photos are lovely, God Bless you Danny! You always inspire me to shoot. Your rain shots are awesome! I’ve always been afraid to shoot in rain due to damage on my camera. I’m so glad I discovered your blog. Beautiful set od photos.I too like bad weather and night time shots though I don’t do it much. I use an old Sony Mavica 400 and 500 which writes the photo on a small disc. I just love theses cameras. 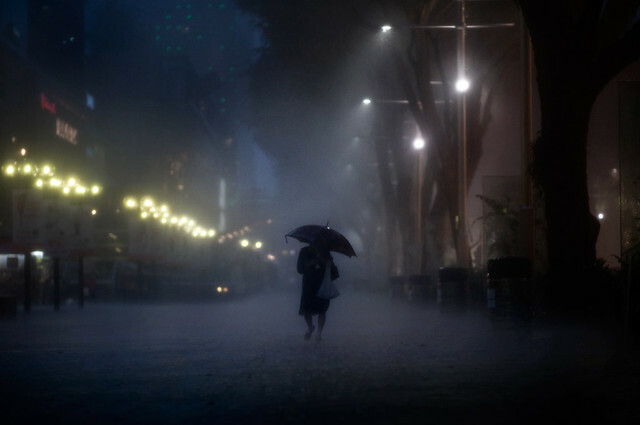 Your night rain shots are simply wonderful and truly inspiring! Hope to see more of your works. Cheers! Could you give us some information about the lens used, ISO, etc ? Hi, I love all your shots. May I know what type of lens and camera body that you use for your street shooting? Taking photos when it’s pouring cats and dogs?? You must be kidding ~ would be my reply, if someone were to ask me. But after seeing your photos, I would like to grab my camera and go out to shoot. I simply want to say I am just beginner to blogging and site-building and honestly loved this page. Very likely I’m planning to bookmark your blog . You amazingly come with really good article content. Thanks for sharing your website. What i do not realize is if truth be told how you are not actually a lot more well-appreciated than you may be right now. You’re very intelligent. You recognize thus considerably with regards to this matter, produced me for my part believe it from a lot of numerous angles. Its like men and women don’t seem to be interested unless it is one thing to do with Woman gaga! Your individual stuffs excellent. At all times handle it up! Great web site. A lot of useful information here. I¡¦m sending it to a few friends ans additionally sharing in delicious. And obviously, thank you to your effort! of course like your web-site however you need to test the spelling on several of your posts. Several of them are rife with spelling issues and I to find it very troublesome to tell the reality then again I will certainly come back again. Its like you read my mind! You seem to know so much about this, like you wrote the book in it or something. I think that you can do with a few pics to drive the message home a bit, but instead of that, this is excellent blog. An excellent read. I will definitely be back. Whats Taking place i’m new to this, I stumbled upon this I’ve found It absolutely useful and it has aided me out loads. I’m hoping to contribute & aid different customers like its aided me. Great job. It is truly a great and useful piece of information. I¡¦m satisfied that you just shared this useful information with us. Please stay us up to date like this. Thanks for sharing.